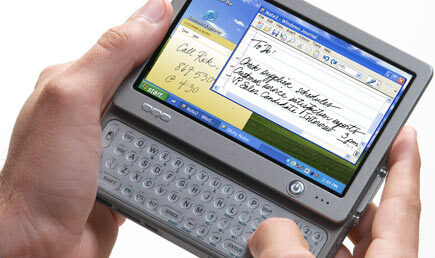 In my long-running obsessive quest for the ultimate pocket PC, I was able to check out the OQO. Peter Harvey, hot shot MySQL developer focused on ODBC, has one of these and he was gracious enough to give me some time on this thing. (Frankly, he could have charged me $10 an hour.) The OQO (pronounced just how it looks "oh-quo") was designed by some gurus out of Apple who developed the PowerBook laptops and have now focused their efforts on a super-portable Windows device that weighs less than a pound and fits in an inside jacket pocket. Dimensions: 4.9" x 3.4" x 0.9"
While it's not a speed demon, it feels as fast as my Sony Vaio laptop which uses an Intel Centrino chipset. In tests of browsing, email, powerpoint the performance was very good. Peter's also managed to get Ubuntu Linux running on the OQO in a second disk partition, which is pretty cool. Memory and disk space can't be upgraded, so you wouldn't want to use this as your main machine, but for travel or going to meetings, it's pretty cool. Or I should say, it's actually pretty hot; the OQO heats up quite a bit. While every handheld device has its tradeoffs, the OQO is pretty good for what it does. The weaknesses are fairly significant though. You can't touch type on this machine, it won't run all day on battery power and it's expensive. Still, I think the OQO is a better machine overall than Microsoft's recently announce Origami, now known by the ungainly name Ultra-Mobile PC (UMPC). While the OQO is not perfect, it will be interesting to see what else they have in store for OQO 2.0 or 3.0. If there's a way for them to deliver a clamshell design with a keyboard you can type on, and 4-5 hour battery life, then I think it could be a great machine. Based on their latest announcements, I think OQO understands the market requirements better than anyone else: business apps need a keyboard! However, the biggest benefit of the OQO, that is, it's ability to run Windows XP, could be it's biggest drawback. Windows XP is a resource hog and by the time you add standard Office applications it's going to consume a lot of disk space and memory. It could be that the Nokia 770 is a better path to handheld Nirvana. But in either case, for a machine to really be successful, I think it will require a clamshell design and a keyboard you can actually type on, like the old Psion Series 5.